The stars are distant, undefined, vague. Twinkles overhead at night - those are the lights of Vaghe Stelle. Inspired by both the bare lamps of Adolf Loos, who deemed all ornaments a crime, and by Leopardi’s Canti (“Vaghe stelle dell'Orsa, io non credea tornare ancor per uso a contemplarvi…”), this extremely elegant lamp by architect Antoni de Moragas i Spà, the son of Antoni de Moragas Gallissà, also an architect and the first president of ADI-FAD, was envisioned during the restructuring process on an old textile warehouse in Barcelona’s new Brasserie Flo in 1982. 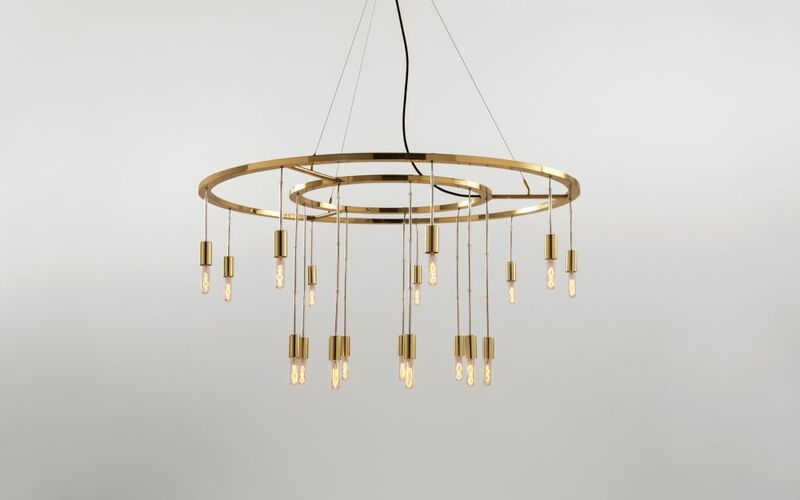 Two concentric brass rings hold aloft as many as 18 carbon filament bulbs by means of a number of glass ossicles at different heights, generating an exquisite amber-coloured light like a wandering night star. Note: Pyrex Tubes. Transparent electrical cable. Antoni de Moragas i Spà was born in Barcelona in 1941, where he continues to work as an architect and designer. The son of architect Antoni de Moragas i Gallissà, one of the leading figures in the architectural renovation of post-war Spain and one of the cornerstones of modernity who has become a design classic, he studied at the Faculty of Philosophy and Arts and graduated from Barcelona's School of Architecture (ETSAB) in 1972. In 1985, he completed his PhD in Architecture with a thesis on AAntoni Mª Gallisà. His first architectural jobs were at Ricardo Bofill's Architecture Workshop, MBM Arquitectes and Gregotti Associati International in Milan. Throughout his career he has combined his work as an architect with teaching and interior and furniture design. He has been a projects teacher at the Barcelona School of Architecture since 1972 and taught interior design projects at EINA Design School since 1977. In 1987 he also became a lecturer at the ETSAB. He has been chair of Arquinfad and a visiting lecturer at the Schools of Architecture of Budapest, Buenos Aires and Rome. Moragas i Spà has won several awards for architecture and interior design, including the Domènech i Muntaner award from the Catalan Architectural Studies Institute (1986), the FAD award for architecture (1987), and the City of Barcelona architecture award (1990).